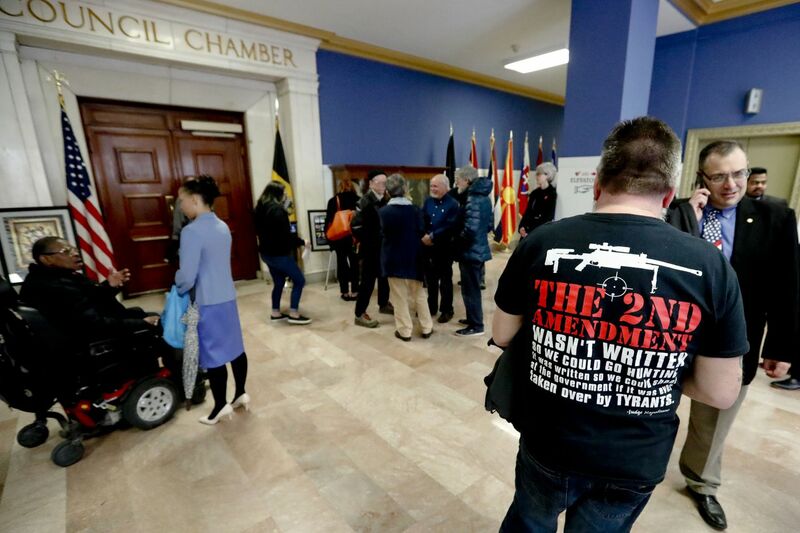 Dennis Jordan, right, a Pittsburgh resident, wears a shirt supporting the 2nd Amendment as he waits with others to attend a Pittsburgh City Council meeting regarding proposed gun restriction legislation, Tuesday, April 2, 2019, in Pittsburgh. A universal background checks bill approved by the U.S. House awaits a vote in the Senate. As a bipartisan bill to institute universal background checks awaits its fate in the U.S. Senate, the debate over firearms is forefront in the minds of many. If signed into law, it would require a background check on all gun transfers. Rep. Lou Correa (D., Calif.) explained that universal background checks would “absolutely” make purchasing a firearm more expensive and “the bureaucratic issues involved are going to slow down the process." Supporters frame these costs as helpful in preventing gun use and therefore, gun deaths. Opponents argue that background checks have zero effect on deaths. One issue no one’s talking about enough is how the cost of background checks disproportionately impact low-income people. Classism has long permeated the movement for gun control. Throughout the 1960s and 1970s, antigun advocates attempted to ban thousands of inexpensive handguns and employed the term “Saturday Night Special” to refer to these low-caliber pistols. They claimed that mostly criminals owned and used these “junk guns" without fully investigating which gun owners this ban would actually impact. While the debate about “Saturday Night Specials” isn’t nearly as prevalent today, classism still runs rampant in the movement for gun control. In the recent hearing in the House Judiciary Committee on H.R. 8 bill, various representatives expressed support for efforts that increase the cost of owning a firearm. Rep. Cedric Richmond (D., La. ), himself a gun owner, recalled the effects of the assault weapons ban, saying that the ban made the cost of a particular firearm “go up from $400 to $1,500.” He calls this increased financial barrier a “good thing” because it “allowed for a cooling time.” This cooling time, he explains, would help prevent someone with violent tendencies from purchasing a firearm quickly and using it to commit an act of violence. While this approach is surely well-intentioned, it strips low-income Americans of their right to defend themselves, when poor Americans are far more likely to be victims of violent crime. Americans earning the lowest incomes (less than $10,000 per household) are 206 percent more likely to be the victim of violent crime compared to Americans earning the highest incomes ($75,000 or more per household), according to a 2017 report. Gun ownership, on the other hand, increases significantly at higher socioeconomic levels. A 2014 study found that 44 percent of American households with an annual income of at least $90,000 owned firearms. Of households earning less than $25,000 a year, however, only 18.2 percent reported owning a firearm. These numbers aren’t surprising, as gun ownership amounts to a “luxury” that many cannot afford. Among the cheapest newly manufactured guns in the United States is the Cobra Arms Freedom .380 priced at around $130. That cost is before ammunition (hollow-point bullets for self-defense and full-metal jacket bullets for practice), a holster, cleaning supplies, range time, an extra magazine, targets, eye/ear protection, mandatory training, licenses, and fees. While buying discount ammunition and a cheap handgun is an option, being fully proficient with a firearm requires training and practice, making gun ownership a huge financial endeavor for many Americans. Costs already vary widely across state and city lines, creating other inequalities. In Washington D.C., for example, the private transfer of a firearm requires a $125 background check — nearly doubling the cost of the cheapest firearms available. In the Philadelphia area, background checks can add between $50 to $100. While the costs of background checks, fees, and permits differ, they have one thing in common: They add an additional financial barrier to legal and responsible gun ownership. Ultimately, we all want to live in a safe, just world, but pricing America’s poorest citizens out of the right to bear arms is not justice. It’s discrimination.